“Andrew Shields knows it’s time to walk his dog when the evening light show begins in the loading dock at ART Condos, an 11-storey midrise at Dovercourt Rd. and Sudbury St. where he lives with his wife. The builder, Triangle West Development, led by artist-turned-developer Gary Silverberg, has transformed the building’s loading dock — normally an unremarkable, utilitarian area reserved for moving trucks and trash bins — into a funky, flashy theatre space. 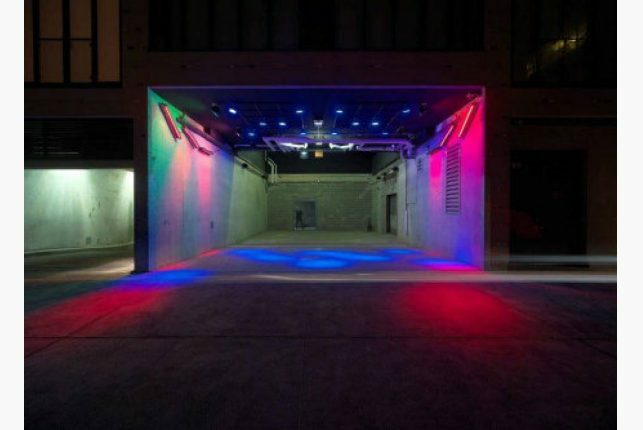 Equipped with a dozen professional stage lights, mirror ball, a projector and a 14-foot wide theatre-quality screen, the loading bay shows movies and art displays on a 24-7 loop. 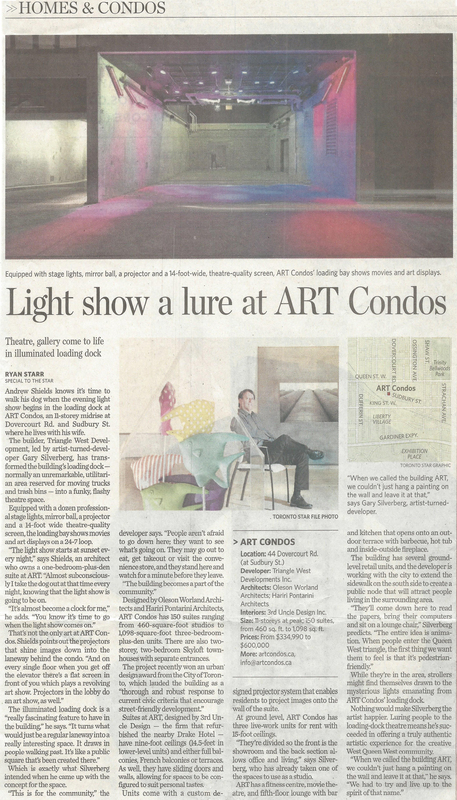 “The light show starts at sunset every night,” says Shields, an architect who owns a one-bedroom-plus-den suite at ART. “Almost subconsciously I take the dog out at that time every night, knowing that the light show is going to be on. 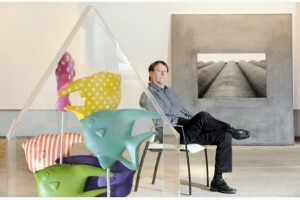 Which is exactly what Silverberg intended when he came up with the concept for the space. “This is for the community,” the developer says. “People aren’t afraid to go down here; they want to see what’s going on. They may go out to eat, get takeout or visit the convenience store, and they stand here and watch for a minute before they leave. Designed by Oleson Worland Architects and Hariri Pontarini Architects, ART Condos has 150 suites ranging from 460-square-foot studios to 1,098-square-foot three-bedroom-plus-den units. There are also two-storey, two-bedroom Skyloft townhouses, with separate entrances. Suites at ART, designed by 3rd Uncle Design — the firm that refurbished the nearby Drake Hotel — have nine-foot ceilings (14.5-feet in lower-level units) and either full balconies, French balconies or terraces. As well, they have sliding doors and walls, allowing for spaces to be configured to suit personal tastes. Units come with a custom-designed projector system that enables residents to project images onto the wall of the suite. At ground level, ART Condos has three live-work units for rent with 15-foot ceilings. “They’re divided so the front is the showroom and the back section allows office and living,” says Silverberg, who has already taken one of the spaces to use as a studio. ART has a fitness centre, movie theatre, and fifth-floor lounge with bar and kitchen that opens onto an outdoor terrace with barbecue, hot tub and inside-outside fireplace. The building has several ground-level retail units, and the developer is working with the city to eventually extend the sidewalk on the south side to create a public node that will attract people living in the surrounding area. While they’re in the area, strollers might find themselves drawn to the mysterious lights emanating from ART Condos’ loading dock. Nothing would make Silverberg the artist happier. Luring people to the loading-dock-theatre means he’s succeeded in offering a truly authentic artistic experience for the creative West Queen West community. © 2014 Art Condos Blog. All images are copyrighted by their respective authors.